BRIGHTON, Mich.- It seems like every other day automakers are touting a new fuel efficient or electric car technology, but Ford Motor Company has gone above and beyond with their latest tech application. 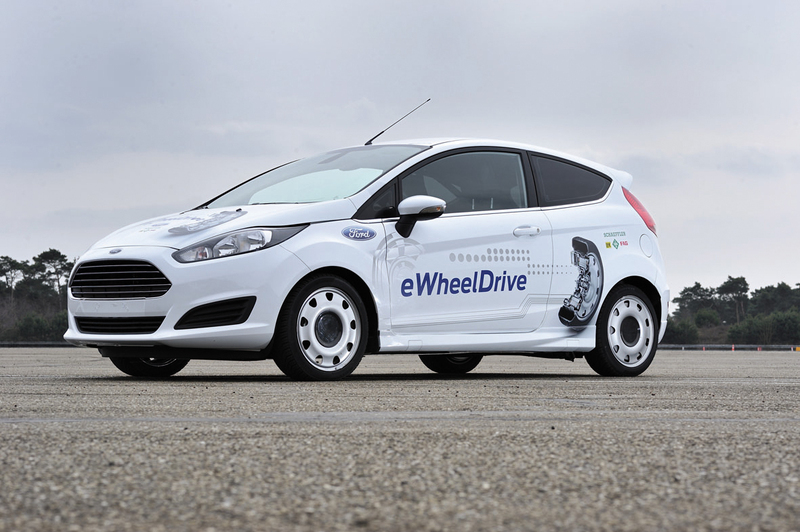 The new Ford eWheelDrive Fiesta prototype was designed in partnership with auto industry supplier Schaeffler and offers a new electric technology unheard of before! Ford Motor Company's new electric car technology propels the vehicle through electric motors located entirely within the wheels of the car. Therefore, the drive wheels don’t need to be connected to a common drivetrain, which creates endless possibilites for the vehicle. One major advantage is all of the extra space, especially if a flat battery pack is installed along the floor of the car instead of under the hood like in the prototype. Passengers in the new eWheelDrive Fiesta will enjoy a roomier interior. In addition, the demo-vehicle is rear-wheel-drive, but the new technology makes it relatively simple to configure a front-wheel-drive or all-wheel-drive vehicle. However, the most impressive feature available with the new motors is the possibility for sideways parking! With a specially designed suspension, all four wheels have the ability to rotate almost 90 degrees since the drive wheels don’t have to be connected to a common drivetrain! Urban drivers would be able to slip into a parallel parking space perpendicularly! As you probably guessed, the new Ford eWheelDrive Fiesta prototype is in the early development stages, but Ford Motor Company expects to build two more prototypes by 2015. To cope with your current parallel parking fears, check out the new self-parking option available on many Ford vehicles. Stop by your Grand Blanc Area Ford Dealer to try it out and check out our 2013 Ford Fiesta Brochure.